Welcome, updated as of September 2000. This is the site of Gallant Warriors From the Sea. The first book on the history of the Philippine Marine Corps. Book Details and Ordering Information. 531 Padre Faura, Ermita, Manila, Philippines. Copies can be ordered from AVA, PoBox 21104, Oxnard, CA 93034, USA. Send a Money Order for US$14.95, plus US$3.50 shipping for US orders. *Suplemental pages for book owners of "Gallant Warriors From the Sea...", are being made available. Contact above e-mail address to register. "...ALERT ordered." State of Rebellion!?! Election duties, "Defend the Balot!" US hostage is rescued by Force Recon Team Assault. Is it Keblar or Kevlar? The new Marine Helmets. BOMBS in Manila! Military Working Dogs can help in detecting them. This is not a Drill! December 7 is rembered as the attack on Pearl Harbor. Is there an attack on the Philippine Marines? Kauswagan:"The Marines have landed... And all is well at hand!" Marine Armored Car 1/35 scale resin kit available. Modernization for the Armed Forces of the Philippines. Philippine site on the Korean War PEFTOK. I was there...with the "First (and only) Filipino entertainment troupe. 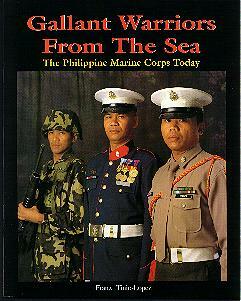 The book "Gallant Warriors From The Sea" is the first book writen on the Philippine Marines. It is the first part of a volume of several books that covers the Marines history, development, and their future plans. Marines in the News Achive of Balita News. She could be the Flag Officer in Command (FOIC) of the Marines some day. Poem forwarded from the Unofficial Phil. Airforce website.